Well, it seems like our days of seeing Justin Long and John Hodgman play dueling computers may have finally come to an end. 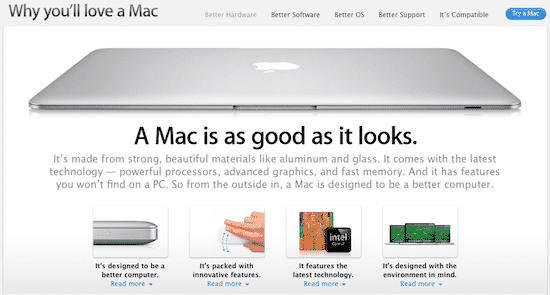 Apple seems to have removed the popular “I’m a Mac” line of advertisements from their site, and replaced them with this new bit of marketing: Why You’ll Love a Mac. I’m not particularly surprised, because the I’m a Mac line has been around for years now, and it’s about time things change. Since that campaign started, Apple has gone from a company that mostly pushes computers and MP3 players to a huge cell phone provider and the creator of a new line of portable computers with the iPad. Time for a different strategy. This was the topic of conversation tonight with my wife over dinner. My mom loves her iPad, and every time I see her she’s asking me about new ways to get things accomplished on the device. She wanted a to-do list, so I recommended Things. It’s a bit pricey for the iPad, but it would do the job she was looking for. I mentioned that it synced via Wi-Fi with my Mac, and she asked if she could see that when she came by the house next time. People who own iPhones and iPads may not be Mac users. For one reason or another, they’re using PCs to get jobs done, and that may be all they’ve known. 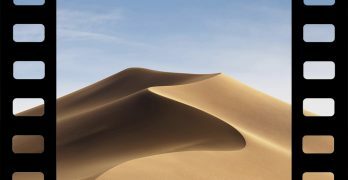 But as they see how easy the iPhone and iPad is to use, they start to wonder about using a Mac for their main device. Would it be better? Easier? Simpler? Previous Apple campaigns have pushed this same concept. But now, with people in the store to look at the other goods, this might have a better chance at working. I know it’s working on my mom, at least. Sounds like the iPad Halo effect.